Stone Oak Park, located in North Central San Antonio, is a 250-acre natural area park with 2.5 miles of walking trails and a 100-seat outdoor amphitheater. The park is uniquely situated at the intersection of four ecoregions - the Edwards Plateau, South Texas Plains, Cross Timbers and Prairies, and Post Oak Savannah. As such, the area contains a highly diverse group of plants, animals, rocks, soils, and karst features. The area also sits atop the recharge zone for the Edwards Aquifer, a groundwater system touted as one of the most prolific limestone artesian aquifers in the world. Local universities routinely bring students to the area on field trips for observation and research given its wealth of natural resources. These curricular units allow teachers in Grades K-5 to utilize Stone Oak Park as an Outdoor Science Laboratory with their students. In so doing, our goal is to increase student interest and achievement in the sciences. 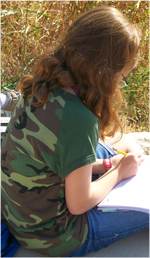 Studies of the use of outdoor, environmental contexts consistently show significant increases for students in the areas of academic achievement, engagement and enthusiasm for learning, pride and sense of ownership, and attendance, as well as decreases in discipline and classroom management problems (e.g., Closing the Achievement Gap, 1998; California Student Assessment Project, 2000; Changing Minds: The Lasting Impact of School Trips, 2006). Thus, development of Stone Oak Park as an Outdoor Science Laboratory seeks to involve students in ongoing study and conservation of the park setting, bringing them back year-after-year to observe the changes and adaptations of the natural world. All units are aligned with the Texas Essential Knowledge and Skills and written using Wiggins and McTighe’s (2005) Understanding by Design (UbD) framework. Teachers at Canyon Ridge Elementary School (adjacent to the park) in the North East Independent School district developed and field tested each unit, in collaboration with Trinity University and the San Antonio Parks and Recreation Department. For more information on using units in the park, contact Dr. Laura Allen at lallen@trinity. Click to view Unit Topics and Materials.